I’m happy share news of two new books by authors I admire for their fine writing and compelling plots. 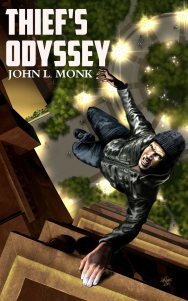 The Kindle version of John L. Monk’s new book, Thief’s Odyssey, is currently sale priced (for a limited time) at 99 cents. This is the most recent book I’ve read, and it had me wondering, laughing, and hoping for the thief hero and his good intentions! Thief’s Odyssey is Monk’s third novel. He’s earned a lot of fans and great reviews for the other two, Kick and Fool’s Ride, which trace the predicaments of a man endlessly reincarnated in the bodies of bad guys. Monk is currently writing the third novel in that series. In its short life, Thief’s Odyssey has racked up solid 5-star customer reviews. Try it–you’ll like it! 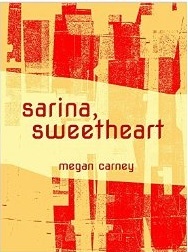 The second bit of book news concerns yesterday’s launch of Sarina, Sweetheart, a compelling thriller by new author Megan Carney. I challenge you to read the Kindle sample and not want more. When you follow the link to Amazon, you may see one of two covers. The white is newer, but both images will lead you to the same ebook. Megan’s book looks fascinating — and it was a quarter finalist in the ABNA. Pretty cool. Take Carol’s advice — seriously. She’s the bomb!